Konstsmide set of 10 LED festoon lights have frosted acrylic shades in the same shape and size of a standard GLS lamp, which are linked together with black cable and lamp holders. 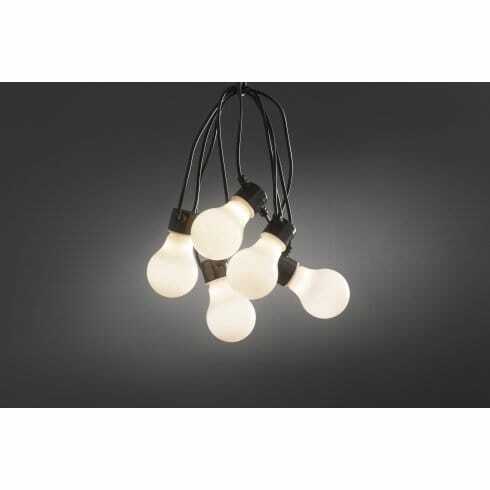 The product code for this Konstsmide festoon light set is 2388-120. This fabulous and practical lighting set Konstsmide is IP44 moisture protection rated for use both indoors and out. It is ideal for parties, barbecues or for year round external decoration. Please note that the transformer is IP20 rated so must be connected to an indoor socket. The integrated, warm white LED's are incredibly energy efficient to use, will provide approximately 50,000 hours of life and will not need replacing.